The CCBoot has two ways for checking the error logs. 1) In the menu bar of "View" for the main interface of CCBoot, click "View Fatal Log" (Figure 1‑1). 2) It will pop up the log which records the errors (Figure 1‑2). 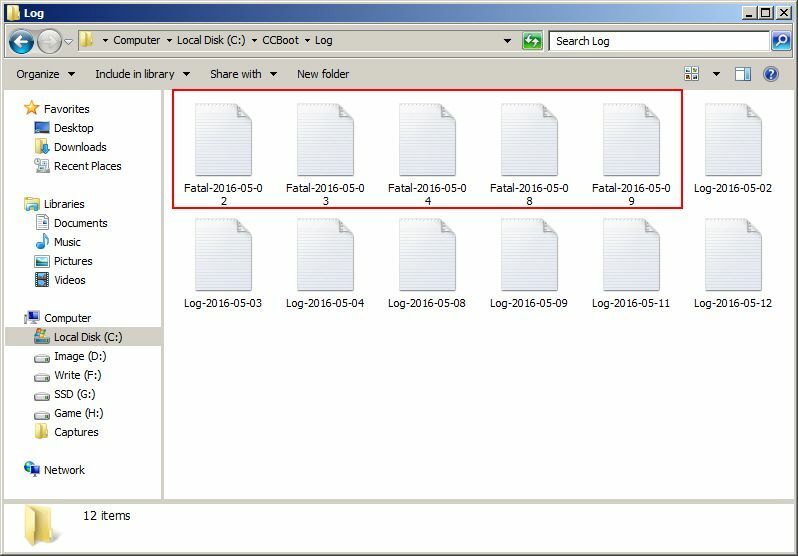 In the CCBoot installation folder, double-click the "Log" file. The error log starts with "Fatal" (For example, "Fatal-2013-01-22") (Figure 1‑3). This error indicates the error log of the RAM, which belongs to procedure bug. The dump files shall be submitted to the development personnel according to the fifth procedure. a) If the file of the writeback disk has error, for example, a blackout of power will cause the error of the writeback files. If the service needs to be stopped, reformat the write-back disk and restart the service. 3) *** ERROR *** open image D: xp.vmdk failed: A file was not found process mem 82m threads 10.
a) According to the log, check whether the image package exists . b) If the image package is broken, the images shall be restored from the spare images and shall be remade. Checking failed error log. Possible reasons: the serial number of purchase is problematic, contact the seller. 5) There is a dump folder in the installation folder of CCBoot, if the dump folder has the *.dmp files, please compress dump folder and send the zip file to support@youngzsoft.net. For details, please refer to "Solutions for Program Crash". Note: In CCBoot recent builds, most of the dump files are related to the write-back disk problems, it may due to the write-back disk error, or because the write-back disk is full. Normally, it indicates the write back disk is full at that time. If this error is logged, then please re install CCBoot once and make sure to reboot when CCBoot ask you to reboot. 8) "getlasterror=1392: The file or directory is corrupted and unreadable." This error may because the disk is broken, please chkdsk or reformat the disk. Or it may because the disk is full at that time. This problem may be related to write-back disk problem. Maybe the write-back disk is small or broken. Please replace a new larger HDD for the write-back disk and try again. "Open image E:\postadmin1.vmdk failed: Disk encoding error process mem 15M threads 11"
This is caused by the vmdk language code. Please try to change lang settings for non Unicode programs. 11) 13:24:36 *** ERROR *** file_write 1 error 112 reason: 0x70 Insufficient disk space. 12) 13:24:36 *** ERROR *** file_read 1 error 38 reason: 0x26 has reached the end of the file. 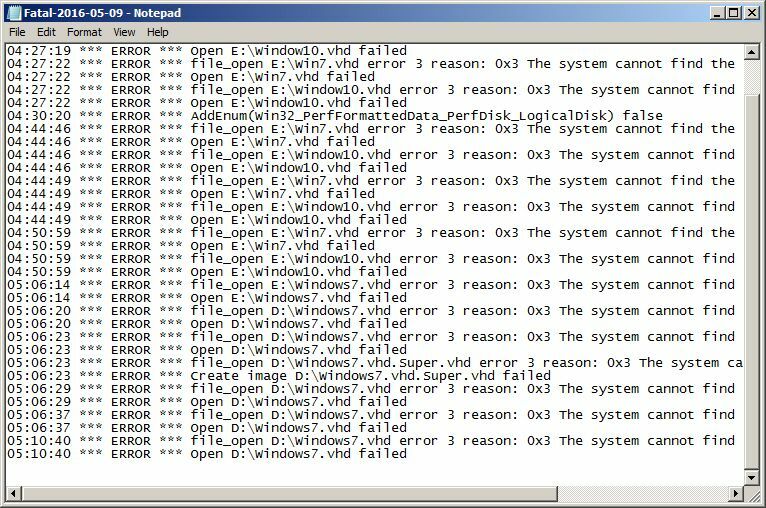 13) 07:25:29 *** ERROR *** file_open E:\Win7.vhd error 3 reason: 0x3 The system cannot find the path specified. 07:25:29 *** ERROR *** file_open E:\Window10.vhd error 3 reason: 0x3 The system cannot find the path specified. This error means that the mentioned image file is not present in the path. This happens when you have changed server and settings are not set correctly. Set the image path correctly to resolve this issue. 14) 07:43:57 *** ERROR *** file_open E:\Win7.vhd.Super.vhd error 3 reason: 0x3 The system cannot find the path specified. This error occur when image file is not located on the image path and you try to superclient that image on a client. To resolve this set the image path correct. For these errors, please check if the image is mounted on windows or not. if the files are mounted then unmount them from the windows. 17) 07:38:52 ERROR lock volume \\.\G: failed reason: 0x9e The segment is already unlocked. 1. 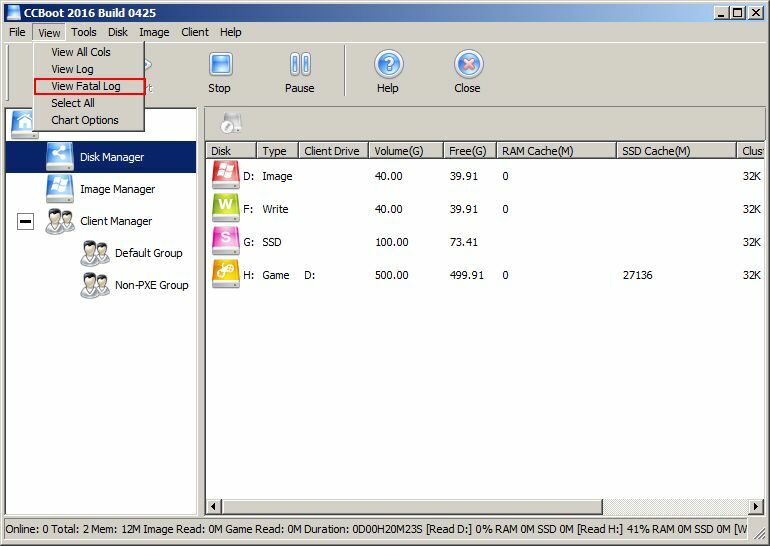 Make sure the Game disk not the same as Image. 19) 10:12:44 *** ERROR *** file_read 0 error 6 reason: 0x6 The handle is invalid. The above error occurs when you enable superclient to game disk when you have client running from the CCBoot. Solution: To solve this, turn of all the other client before enabling superclient to the game disk. 20) 17:22:33 *** ERROR *** file_open \\.\D: error 2 reason: 0x2 The system cannot find the file specified. Solution: format the drive again and add to the CCBoot, if the error repeat again, then better to replace the disk that the drive belongs to. This error denotes that the writeback disk has corrupt data and is not able to overwrite it with new writeback data from the client. Stop CCBoot service, then delete all the writeback data from the writeback disk. If any writeback data is not deleted that means there is corrupt data. To fix it, format the writeback disk to clear the corrupted data from the writeback disk. This error is logged if you are using Crack for CCBoot and not legit license. 14:16:14 ** Error ** Set game cache failed. drive: J ram: 1024 ssd: 0 reason: 0x1f A device attached to the system is not functioning. 14:16:14 ** Error ** Start game cache failed. drive: J ram: 1024 ssd: 0 reason: 0x1f A device attached to the system is not functioning. 1. disk disconnected from the server. To resolve this follow the instructions below. b. If RAM is working fine, then uninstall CCBoot, and delete all configuration files from the installation directory, then re install CCBoot and configure it. c. If re install is still not fixing the issue, then please remove any blockage for CCBoot in the system like in firewall or in hosts files as if CCBoot cannot activate properly. 26. "DHCP socket error in getsockname: 10055 reason: 0x2747 an operation on a socket could not be performed because the system locked sufficient buffer space or because a queue was full." With a large number of clients (100 or more) on one server, can see the following in the logs of critical errors as above. This error occurs because of the large number of concurrent connections (by default, win server 2008 is set to 5000). Due to this error, your clients will not receive IP address from DHCP and any PC can randomly lose connection from CCBoot and reboot. To fix this, you need to add more slots, this can be done using the registry editor. 4. Close the registry editor and restart the CCBoot server.